GRAND JUNCTION, CO USA ― October 2018 ― GPD Global, a manufacturer of high quality precision fluid dispensing systems, conformal coating, and component prep systems will exhibit at the upcoming SMTA International 2018. The Expo is scheduled to take place October 16-17 at the Donald E. Stephens Convention Center in Rosemont, Illinois..
Conformal Coating Machine with excellent repeatability for under $40,000!!! At booth# 517, see our automated Conformal Coating Machine with excellent repeatability for under $40,000. SimpleCoat is cost-effective, inline, selective Conformal Coating System with full featured programming making the conformal coating processes quick and easy to set up. This Conformal Coating System incorporates teach from .JPG programming, SMEMA communication with chain conveyor for inline process, spray and needle valve, an exhaust port with flow sensor, and external reservoir fluid feeding and nozzle park area with solvent baths. In addition, a Tilt and Rotate model is also available. Station 1 can tilt ±45° and rotate ±90° giving you full access to all sides of your device. To further enhance the dispense capability; an optional volumetric pump may be used in place of the needle valve. 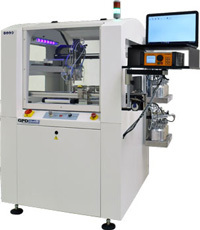 GPD Global manufactures a selection of automated fluid dispensing systems to meet high production and versatility development demands. Stop by booth 517 to see Catalina, the simple and efficient tabletop dispense robot that provides you with standard features such as automatic vision, laser surface sensing, nozzle alignment, and calibration. A tilt and rotate model is also available to meet your production needs. The Catalina benchtop series can be configured with an optional heated work area. The compact dispense robot is easy to learn with its computer-based software and Windows operating system. It uses easy point based teaching for all axis movement with the ability to set point jobs and various parameters. GPD Global’s line of Fluid Dispensing pumps will also be exhibited – see the latest dispense technologies for integration or retrofit. Whether your process requires low or high viscosity fluids, thick pastes, or abrasive media, there is a dispense pump to meet your requirements. The versatile Precision Auger Pump is excellent for dispensing pastes down to 150 µm; the carbide wetted parts are great for abrasive fluids. High speed NCM5000 Jetting Pump dispenses small droplets from 2-4 mm above the surface. Volumetric Pump Series (PCD) dispenses low-to-high viscosity greases with outstanding repeatability. Stop by booth 517. Experts are available to discuss your production needs with you. Whether your project requires a pump for retrofitting or a fully automated dispense system, tabletop dispensers, coating, or component preparation, we have a solution for you at www.gpd-global.com. 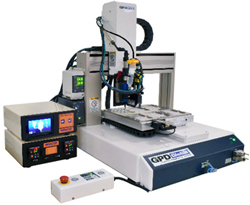 GPD Global is an equipment manufacturer of high quality, precision, automated fluid dispensing, conformal coating, & component-prep systems. The company is an international, state-of-the-art equipment supplier for the PCB assembly and semiconductor industries. We design and manufacture a wide variety of Automatic Fluid Dispensing & Conformal Coating Systems. We also manufacture an SMT Cover Tape Peel Tester and Component Prep equipment for Thru-Hole applications.